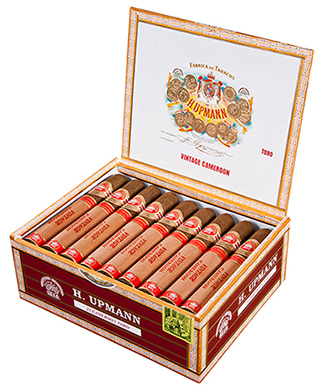 The medium-bodied, full-flavored H. Upmann Vintage Cameroon cigar recalls the distinguished quality and flavor of old Havana premium cigars and is a throwback to the early days when all H. Upmann cigars were wrapped with Cameroon leaves. For more than a century, H. Upmann cigars have been highly respected among cigar connoisseurs and the Vintage Cameroon is a distinctive cigar that admirably continues the tradition. Handmade in the Dominican Republic with a blend of Dominican, Nicaraguan, and Peruvian tobaccos wrapped in a select African Cameroon leaf, the Vintage Cameroon is a well-balanced, luxurious smoke with a unique essence that's slightly sweet, a touch spicy, and very flavorful.